During Tough Break, Valve reworked the Vaccinator again. As a Medic main, I felt it was my duty to try the thing out so I can see for myself if the poor thing has finally reached the lofty echelons of the other mediguns, or if it still sucked. 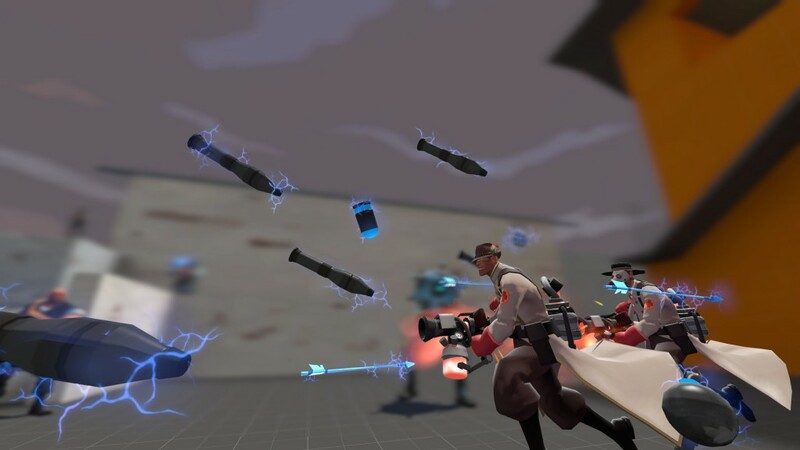 At the same time, I took my new Team Fortress Classic Medic out for a spin! Thanks for the Xmas present Medic! I first tried it out on King of The Hill, a game mode that lets me quickly switch from offense to defense. I found that it served its job decently well in both categories. If I were taking on a single enemy with my pocket, I could easily switch to the correct Uber and give us the edge to win. While it seems kinda weird to even consider a 2v1 a “win”, this still included circumstances where I was put in grave danger and managed to scrape through alive. Except Scouts. Scouts seem to be able to out-damage the bullet Uber. The problem is, once there got to be multiple enemies it seemed to constantly disappoint. Ditto if one of those enemies was using melee; the Demoknight nerf may have indirectly buffed the Vaccinator, but I certainly couldn’t tell when they were still destroying me even with a pocket. I chalked it up to me being bad at the weapon and jumped to CP, where it could maintain the same role for a longer period of time. But somehow, I seemed to be doing even worse. 5CP is second only to payload in having large swathes of enemies that seem to all appear at once, and my two states of being seemed to be waiting patiently for the next wave, and then dying horribly once that wave began. I began playing super passively, avoiding the front lines and helping pick off any enemies who strayed too far from the main group. If that’s the playstyle Valve’s trying to encourage, it didn’t do horribly. I came away from playing with the Vacc feeling, if not impressed, at least satisfied with its performance on the battlefield. Every situation I did well with the Vacc, I still think any other Medigun would have worked too. But then I switched to the Quick-Fix and had a blast. Here was a Medigun with a solid definable role that it excels at. It became immediately apparent how to use the gun and it was a hell of a lot of fun even when I wasn’t sure what I was doing. The Vaccinator is missing that thrill on a fundamental level, the powerful simplicity that every other Medigun has in spades. At the moment I guess it could be considered balanced, or at least less underpowered than it was before. But it’s still extremely unremarkable and I can’t think of situations where I’d willingly equip it over its competitors. And after so many reworks I’m about ready to throw the whole concept away as unsalvageable, because I can’t think of any adjustments Valve hasn’t already tried. Unfortunately the only concept I’ve ever really liked on any Vaccinator build was the crit-nullifying bug. Picture by Gen. DeGroot. I know at least a few people on SPUF main the gun, and I’d love to hear from them. If I’m using the Medigun wrong, I’m totally ready to accept that, but I’d love some coaching on what the gun actually wants to accomplish. Because even after the rework, I’m not seeing it. It’s definitely by far the trickiest Medigun to use. You need to practice with it quite a bit to get the hang of it, more so than Stock, Quick-Fix, and the Kritzkrieg combined. You have to know what resistances to toggle to and when; a good rule of thumb is to always be on bullet resistance when not under attack, because hitscan is instantaneous, explosive resistance is only a click away, and flame resistance is the least used of the three. Overall, nothing too tricky, and I’m personally glad that Valve didn’t add melee resistance, since it would just make the system harder to cycle through and not really matter in comp. That’s only half the battle, though; using the ubers in combat is where experience comes in handy. You have to time ubercharges properly, and be careful when you use them. Unlike with the other three ubercharges, if you pop too soon, you just completely wasted the uber; while that may not seem so bad, as you can have up to four ubers charged at a time, it’s bad because the true power of the Vaccinator comes in its ability to serve up four ubers *when they count*. Sure, the Medigun can save you if you need it, but the Vaccinator can save your rear four times in a row if you really hone your gamesense. That’s why using it in combat can be so tricky; matching damage resistances is one thing, but knowing the exact moment when to use your ubers to make them count for as much as possible takes a lot of practice with the Vaccinator. Finally, though, the Vaccinator has a couple of weird properties that just take practice / experimentation to understand. Valve recently changed it so that if you switch from the Vaccinator while using uber, the uber depletes instantly, so no switching to Ubersaw, hitting the Spy behind you, and switching back to continue the uber. Then you can actually protect a bunch of people throughout the duration of an uber by flashing multiple people, because by “vaccinating” them, they get these “uber bubbles” (which were introduced in Gun Mettle) which protect them for the rest of the uber. They’re useful, but they’re a bit hard to grasp at first. And I recently learned that you can apparently give someone multiple uber resistances at a time; I’m actually not sure how this works, but I intend to find out today. Overall, if you really know how to use it, I’d say that the Vaccinator is better than Stock or Kritzkrieg for protecting people from damage, although it doesn’t have that big “Here we go!! !” moment where you finally activate uber and go around with your patient terrorizing Tokyo like frickin’ Godzilla. I haven’t had enough time yet to compare Quick-Fix and Vaccinator after the Tough Break update, but I can already see times when I would use the Quick-Fix or the Vaccinator over the other, and that’s good. I’ve seen some comp Medics say that they’re considering using Vaccinator as an end-of-the-round Medigun on King of the Hill or for pocketing a Heavy on last, and at the end of the day, as long as there are good reasons to use a weapon in comp, it’s fairly well-balanced in my book.